The Southland Auto Group is proud to work with the United Way of South Eastern Alberta. For more than a decade, we’ve proudly partnered with them to make a difference in the lives of the children in our community. We realize that aiding the early development of children is the best way to ensure that they’ll thrive in the future, and become happy and healthy members of society. Through our programs such as the Christmas Toy Drive and Tools for Schools, the Southland Auto Group aims to make it easy for us all to give back and support the children in our lives. 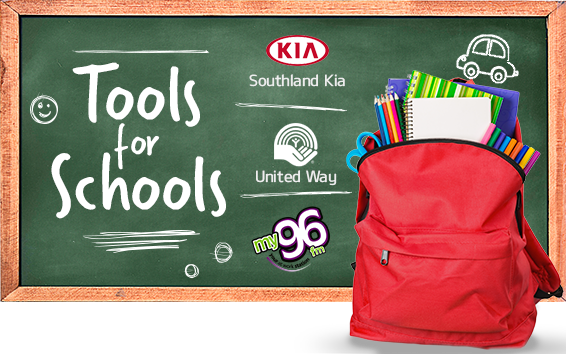 Every year, the Southland Auto Group teams up with The United Way to “Stuff the Bus” full of much-needed school supplies for local children in need. Throughout the month of August, you can help by bringing your donation to our showroom at 1276 Trans Canada Way SE. You can also call us at 1-855-214-6014 to make a donation of $50, which will provide a backpack full of supplies to a child in need. The 2017 “Stuff the Bus” campaign was a rousing success with more than 800 backpacks being bought and distributed to the kids in our community. With your continued support, we aim to make a difference for our kids for many years to come! Since 2007, the Southland Auto Group has held the Christmas Toy Drive in support of the United Way of South Eastern Alberta. Together, we’ve collected a mountain of toys to be distributed throughout our community to children in need. Thanks to the contributions of local politicians, businesses, and the generous individuals around us, we’ve succeeded in delivering thousands of dollars worth of toys to those less fortunate. 2017 was a record-setter, with donations topping $37,000. With your help, we can bring the joy of the season to the children around us every year!